Matt moved to Kennett in August of 1997 and began teaching at North Pemiscot Jr./Sr. High School. While teaching there, he met and began dating Brooke. They were married in July 2000. The Hodges celebrated the birth of their first child, Luke, in December of 2003. Their second child, Landynn, was born in January 2008. 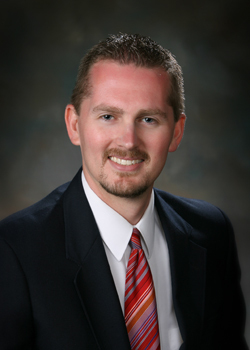 After working 5 years with both the North Pemiscot and Hayti School Districts, Matt served the Caruthersville School District as an administrator from 2007-2011. He is currently the principal of Holcomb High School. Matt loves spending his free time chasing Luke and Landynn around the house, and continues to enjoy working with the youth of the congregation. Matt has served as a deacon since 2006.